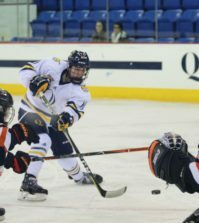 Freshman phenom Kelly Babstock continued her historic season Friday against Rensselaer Polytechnic Institute with a game-high five points–two goals and three assists–in Quinnipiac’s 5-1 victory at the TD Bank Sports Center. 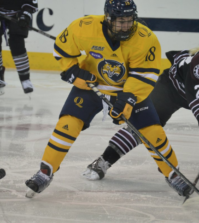 Kate Wheeler and Bethany Demarczyk also had three assists each for the Bobcats (19-10-2, 11-8-0 ECAC), whose win keeps them ahead of Princeton for fourth place in the ECAC. Babstock’s performance extended her conference-leading total in points, goals, and assists to 53, 27, and 26 respectively. It also extended her points streak to eight consecutive games. 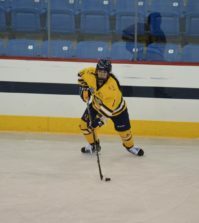 “She doesn’t want to just score on every shift, she wants to score on every second of every shift,” Quinnipiac head coach Rick Seeley said. “That’s exciting; I’ve never coached a player like that. 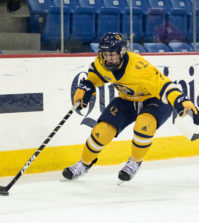 On the first goal of the game, Babstock and Wheeler set up Jordan Elkins for a power-play goal to give the Bobcats a 1-0 lead. .
About six minutes later Quinnipiac scored again as Amanda Colin lifted the puck over Engineer goalkeeper Sonja Van der Bliek to give the Bobcats a 2-0 lead. Babstock, Wheeler, and Demarczyk each had assists as they all tried to put rebounds in before Colin found the back of the net. Before the first period ended Babstock struck one more time, this time on a power-play goal in which she fired the puck past Van der Bliek and into the upper-left hand corner of the net. With the Bobcats up 3-0, Wheeler found Babstock for another goal 7:15 into the second period. At the start of the third period, Babstock tallied her final point, getting the assist on Brittany Lyon’s goal to extend the lead to 5-0. The Bobcats defense held RPI (10-13-7, 8-9-2) to just 16 shots on goal all game, but Engineers avoided the shutout when Jordan Smelker scored their lone goal of the game with 12:44 remaining in the game. The Bobcats wrap up their final home stand of the regular season when they host last-place Union on Saturday at 4 p.m. at the TD Banks Sports Center.